Q88Dry is renowned in the dry bulk industry for managing critical vessel and fleet information needed in the chartering and evaluation processes. Q88Dry offers owners, operators and charterers of bulk carriers a collaborative space where information can be quickly shared and leveraged to maximize fleet utilization, ensure vessel suitability and capitalize on market opportunities. With the industry’s leading charterers, owners and operators onboard, Q88Dry captures real-time industry changes. 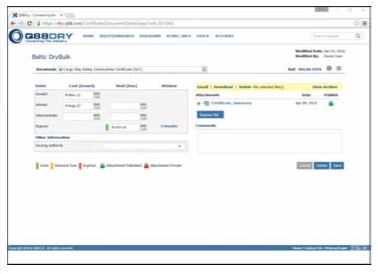 Cloud-based, Q88Dry allows companies the ability to manage all of their fleets’ certificates, documents and questionnaires in one central database. The data directly links to an automated notification system which prompts vessel owners when safety certificates are coming due. In turn, assisting the industry leaders in maintaining the most up to date certifications onboard at all times to ensure safe waters. Q88Dry, a Q88 LLC company, boasts a client list of over 90 companies operating over 1,500 bulkers. Notable clients include commodities trading giants Cargill and Glencore, as well as some of the world’s leading owners and operators including Pacific Basin,Western Bulk, Clipper Bulk and Scorpio Bulkers. clients on six continents, and has 160 years of combined shipping experience. greater visibility and control; and v optimal fleet utilization. partnership with the leading software providers in the industry. no hardware or software to install o accessible from any mobile device.